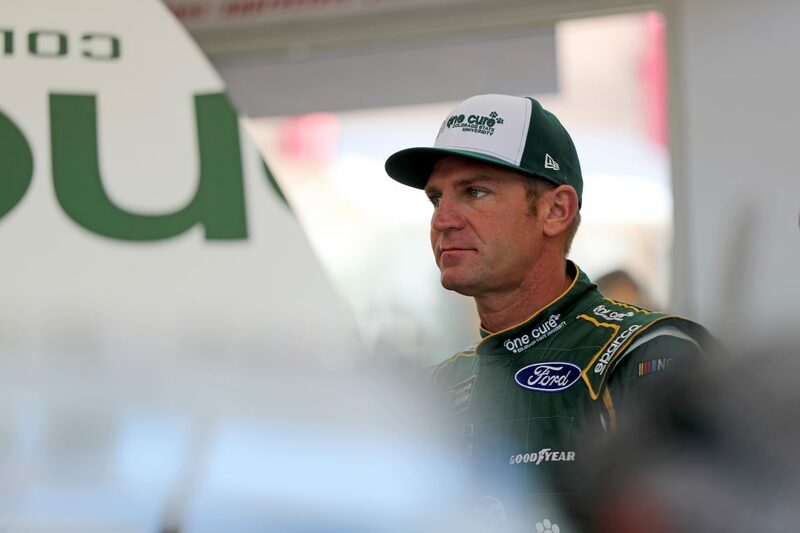 It’s going to be difficult for Clint Bowyer and his three Stewart-Haas Racing (SHR) teammates to top last Sunday’s performance at Michigan International Speedway in Brooklyn . Bowyer won his second Monster Energy Cup Series race of 2018 and, for the first time in its history, SHR swept the top three finishing spots – the first 1-2-3 sweep in the Cup Series since Roush-Fenway Racing did it at Dover (Del.) International Speedway on Sept. 21, 2008. The June 24 Save Mart 350k at Sonoma (Calif.) Raceway is next on the schedule after the Cup Series takes this weekend off to celebrate Father’s Day. Bowyer said it isn’t out of the question for his No. 14 One Cure Ford Fusion and his SHR teammates to put on a repeat performance similar to Michigan at the first of the Cup Series’ two road-course races in 2018. “I don’t want to jinx myself, but Sonoma is my favorite racetrack,” said Bowyer, who has scored six top-five finishes in the last 10 races in California Wine Country. That’s two more top-five finishes than the next-closest driver Kurt Busch, his SHR teammate, who owns four. Bowyer said he was aware how well he and his teammates were racing at Michigan and throughout the season. All four SHR Fords were in the top-five on the opening lap at Michigan. SHR’s four Fords have led 1,530 of 4,595 laps – 33.2 percent – in 2018 on their way to winning seven Cup Series points races plus the NASCAR All-Star Race. Each driver would be in the NASCAR playoffs were they to start now. “That’s the coolest thing about it,” Bowyer said. “You’re up there looking in the mirror, even when I was running second, I said to myself, ‘Gosh, this is a moment.’ We’re running 1-2-3 at a track that is an aero track, that’s a horsepower track, it’s a demanding racetrack on your equipment. But now, SHR’s focus is on Sonoma, where Bowyer finished just .754 seconds behind SHR’s Kevin Harvick in 2017, making it a 1-2 sweep for the team. Busch, the 2011 race winner at Sonoma, and SHR newcomer Aric Almirola are likely to join the Harvick-Bowyer party at the front of the field on the 10-turn, 1.99-mile track. Bowyer, the former body shop repairman who grew up amid the wheat fields of Kansas, nowhere near a road course, claims not to know why he runs well at Sonoma. But he can easily tick off what a driver must do to be competitive at Sonoma. Bowyer’s best moment at Sonoma came in June 2012, when he held off Busch and Tony Stewart, who with Gene Haas co-owns Bowyer’s No. 14 Ford. Bowyer dominated the race by leading 70 of the 112 laps. Defending race-winner Busch was all over the bumper of Bowyer’s car late and got a final shot in a two-lap overtime sprint to the finish. Bowyer raced side-by-side with Busch at the green flag, then cleared Busch and pulled away for the win. Bowyer had to walk to victory lane to celebrate with his crew after his car ran out of gas during the cool-down lap. Stewart passed Busch on the final lap to claim second. Bowyer’s No. 14 team knows a little bit about Sonoma, as well. In addition to last year’s runner-up finish with Bowyer in 2017, the crew chief Mike Bugarewicz-led unit won the race with Stewart in 2016 in what turned out to be the last of Stewart’s 49 Cup Series wins. Obviously, Bowyer and the No. 14 team arrive at Sonoma with momentum. Bowyer’s aggressive driving at Michigan and a two-tire stop just laps before rain halted the race after 133 of a scheduled 200 laps gave the team its second victory of the season. The win moved Bowyer to fifth in the season standings and allowed him to join Harvick, Kyle Busch, and Martin Truex Jr. as the only multiple race winners this season. What is Sonoma race weekend like? What is the secret to Ford’s success? What is the secret to SHR’s success in 2018?